design museum holon is the first museum in israel dedicated to design. opened in march 2010, the building of the museum was planned and designed by israeli architect and industrial designer ron arad. each year the museum presents a varied program of exhibitions and events dedicated to helping visitors gain a deeper understanding of design and the role it plays in our lives. ron arad is an israeli industrial designer, artist, and architect. he founded arad associates which is based in london. on january 31st, 2010 following four years of construction, the design museum holon by ron arad architects, will be inaugurated. 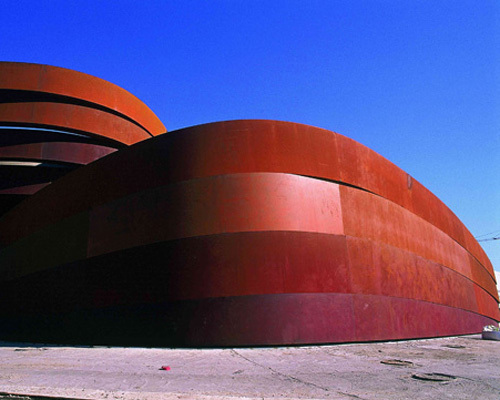 the design museum holon is arad’s first architecture project of this scale. constructed of five sinuous bands of varying shades of COR-TEN(weathered steel), the overall mission of the institution is to explore the impact of design and its relation to urban spaces and everyday life. the new museum will join holon’s mediatheque, a cultural centre which includes the national cartoon museum, repertoire theatre with original productions, cinematheque, material and public library. the project was initiated by holon’s mayor mr. motti sasson and managing director, ms. hana hertsman who invited ron arad to create the iconic building. ron arad architects has been invovled in the project from the program development stage through to the conceptual stage to building completion. the museum is comprised of two primary galleries and a number of alternative exhibition and education spaces. the upper gallery (500m²) celebrates the abundance of natural light in israel and the qualities it can bring to the display of three-dimensional objects, while allowing curatorial flexibility through modulating light levels. the smaller, lower gallery, (250m²) is taller inside but offers a more intimate, personal relationship between the visitor and the objects on display. ‘working together from such an early stage of development has enabled us to find answers to the question of the relationship between curatorial space and public circulation. we were able to capitalise on the potential space between the curves of the bands so that all the surfaces around the galleries and public facilities would fit comfortably in and in many cases, created bonus galleries. the bands form a visual key that carries visitors into the building, through it and then out; the bands instantly become a string that ties the whole building together inside and out,’ says asa bruno, supervising architect. a joyfull mixture of guggenheim and serra. “mixture of guggenheim and serra” – I thought exactly the same! Spoken like another disgruntled architect who has never completed a project.